Harley-Davidson enthusiasts Chris McIntyre and Jeff Brown started EagleRider Motorcycle Rental in Newport Beach, California, in 1992. Using the marketing expertise they had gained working for companies like AT&T, McIntyre and Brown built a business that outfits its clientele with motorcycles and biker gear for day trips or week-long excursions. 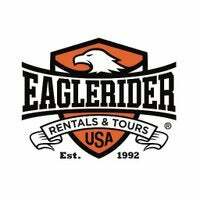 EagleRider centers are located in major cities across the United States, renting motorcycles, selling clothing and accessories, and offering guided tours.